Prop Sean McCarthy has joined Leinster while 21 players have signed new IRFU contracts to stay with the Irish side. McCarthy, 23, arrives from Jersey RFC with the forward having played for Ireland at underage level. He is a young and dynamic prop and we need to have quality players in this highly attritional position," said Leinster coach Matt O'Connor. Ireland trio Jamie Heaslip, Sean O'Brien and Gordon D'Arcy are among the players to renew their contracts. "It's important for us as we continue to build that we have a group of players that are committed to the club and that share our vision for the future," added O'Connor. "While getting 22 contracts over the line is a huge undertaking the enthusiasm of the players was evident and we are very happy with where we are with our retention and recruitment drive. 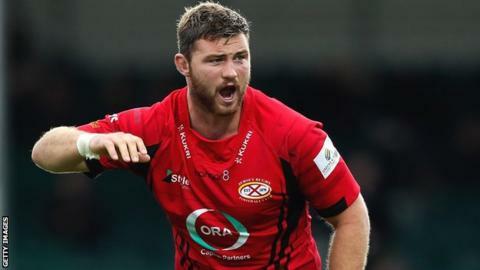 "Sean has performed well for Jersey RFC in the RFU Championship and B&I Cup and we look forward to welcoming him to Leinster in the summer. "There are one or two other players that we have identified as recruitment targets and we hope to announce them in due course."